The Great Flood of 1913: The great flood of 1913 was the worst weather disaster to strike Butler County. Damages topped $10 million in 1913 values, or about $167 in today’s figures. By the time the Great Miami River crested in Hamilton at 34.6 feet, more than 10,000 people were homeless and over 400 deaths reported. Churches of Butler County: Explore the early churches of Butler County. Native Americans of the Miami Valley: Six tribes have lived in the Miami Valley area throughout history: the Archaic, the Hopewell, the Fort Ancient, the Miami, and the Shawnee. Discover who these people were and learn more about their customs and the legacy they’ve left behind for future generations. Tomahawks and Guns: The Indian Wars and Leaders: From the late 1700’s through the early 1800’s, fighting between the Native Americans and the white settles were common throughout the Northwest Territory. Learn more about the principle players on both sides, including Cornstalk, Little Turtle, Blue Jacket, Arthur St. Clair, and Anthony Wayne. Little Chicago: The term “Little Chicago” brings back memories of the age of prohibition and the Great Depression, when practically everyone in Hamilton knew John Dillinger, believed that City Hall and the Police Department was in on the take, and speakeasies were everywhere. Find out how much is fact and what is just fiction when it comes to Butler County of the 1920’s and 1930’s. What’s In a Name? : Do you ever wonder how the places we live got their names? We all know Hamilton is named after Alexander Hamilton, but what about the county and townships like Morgan, Really and Ross? 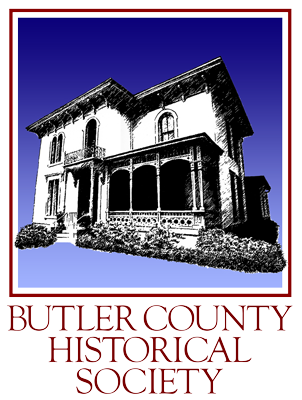 Ghost Towns of Butler County: Learn the history of forgotten towns in Butler County, including Gano, Maud, Pisgah, and New London. Butler County Agriculture in the 1800’s: Experience life on a farm in the 1800’s! Learn about the tools you would have used, the types of crop you might have grown, and more about the role of agriculture in the development of Southwestern Ohio. Learn fun facts like how the father of modern beekeeping lived in Oxford, or that a breed of pig was developed in this area. Butler County Trivia: Coming soon!